The Cherokee Heritage Center offers visitors several ways to experience the history and culture of the Cherokee people. At the Cherokee National Museum, you can view exhibits depicting the history of the Cherokees, explaining the Trail of Tears experience and showcasing the artistic heritage of the Cherokee Nation. You can research Cherokee genealogy at the Cherokee Family Research Center and review historic documents in the Archives. And, of course, you can experience Cherokee life and culture in the Center's two living history areas, the Ancient Village and Adams Corner. 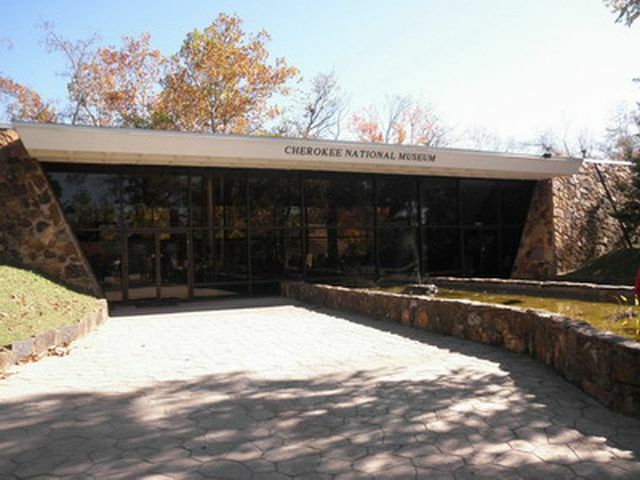 The Cherokee National Museum opened in 1974. Its purpose is to teach, promote and preserve Cherokee heritage, history and culture. The museum contains a permanent exhibit on the Trail of Tears - the forced exodus of the Cherokee people from their homeland to Indian Territory - as well as temporary exhibits on various aspects of Cherokee history and culture. These columns are all that is left of the first Cherokee Female Seminary, built here in 1850 to provide higher education for Cherokee women. The Cherokee Female Seminary burned down in 1887, leaving only these three columns as a monument to its purpose. The seminary was moved to a site north of Talequah, and the original building still stands as part of Northeastern State University. When the Cherokee Nation decided to build the Cherokee History Center's Ancient Village, it seemed appropriate to locate the village at the site of the original Cherokee Female Seminary in order to preserve it and convey its significance to future generations. The Cherokee Female Seminary was one of the first schools where women could pursue higher learning built west of the banks of the Mississippi. Costumed interpreters give guided tours and demonstrate traditional sports, pastimes and activities. They also work with schools and tour groups. The Cherokee Heritage Center interpreters share information about traditional dwellings, foods, activities and crafts. They also work hard to dispel stereotypes about Cherokees and other American Indian tribes. This exhibit of traditional Cherokee tools is one of many displays in the Ancient Village. The Cherokees were always an agriculture-based society, planting and raising crops. Their tools helped them in this work as well as in hunting and building homes. Tests of skill and competitive games have always been part of Cherokee culture. Here, an archer shoots an arrow at a target. Stickball closely resembles lacrosse. In stickball, players use webbing-topped sticks to fling a "ball" - a hide-covered rock - through a goal or at a pole. Stickball was once a means of settling disputes between tribes or groups, which may explain the sport's violent aspects. The ball is very hard and can do great damage if it hits a player. Adams Corner was built to represent life in Indian Territory, after the Cherokees who survived the Trail of Tears arrived. The time period is the 1890s. Adams Corner consists of seven buildings and some smaller structures. In addition to homes, you'll find a schoolhouse, blacksmith shop, church and general store. In any 19th-century community, a blacksmith could be sure of steady business and a certain amount of prestige. Everyone needed his services, either to acquire tools or utensils or to shoe horses. The Weaver's Cottage is filled with tools of the trade - including a spinning wheel, in particular. Spinning and weaving provided the Cherokees with cloth to sell or trade. Log cabins were relatively easy to build, even before the time of the Trail of Tears. Furnishings would have been simple, hand-crafted items, made from local materials. As is common in the travel industry, the writer was provided with a complimentary facility tour, meals and lodging for the purpose of reviewing those services. While it has not influenced this review, About.com believes in full disclosure of all potential conflicts of interest. For more information, see our Ethics Policy.